Kelburn Recovery Centre is a centre of excellence and an internationally recognized leader in evidence-based treatment of addiction. Where is Kelburn Recovery Centre Located? Kelburn Recovery Centre is located in St. Adolphe, bordering the southwest city of Winnipeg, Manitoba. Winnipeg lies at the geographic centre of Canada and North America. The city is just 100 km (62 miles) from the United States border. 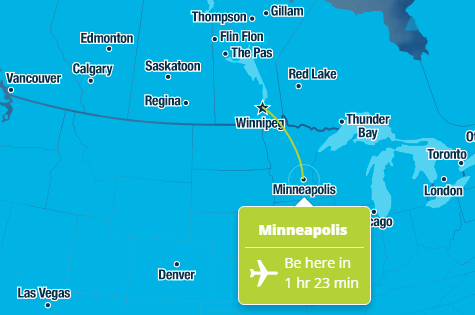 Winnipeg is easily accessible from the east and west via the Trans Canada Highway. The Winnipeg James Armstrong Richardson International Airport serves more than 3.5 million passengers per year with more than 20 Airlines operating out of the airport. It’s only a few hours away with direct flights from major US cities. Kelburn Recovery Centre provides door-to-door service from the Winnipeg International Airport to our rehab center at no charge for patients and their companions who have made admissions arrangements for treatment. Please advise your health advisor at the Addiction Treatment Centre if the patient will be needing assistance other than wheelchair access.